The original Star Wars trilogy was transformative for me. It was my first experience with a true-blue action movie, and cinematic science fiction. My parents took me to see it when the movies re-released in theaters during the 1990s. I was young — so young I couldn’t yet read the intro scrawl at the beginning of the films. But it didn’t stop me from being completely enthralled into the world of the space opera, the larger-than-life conflicts of heroes and villains, action & adventure, the space battles and romantic sci-fi fares we are all now so familiar with. It was one of three films which were most memorable and impressioned me in earliest childhood, next to Lion King and Toy Story. Out of everything that is introduced in A New Hope, and then subsequently explored in The Empire Strikes Back and Return of the Jedi (and then even further in the Extended Universe novels), the most salient fascination for me was always the concept of the Jedi (like many others, I would guess). Jedi: an interstellar and near extinct order of warrior monk, wielding a laser sword, which takes the martial arts as seriously as the philosophical ones. It was just about the coolest possible thing. As a child, it changed everything. And even now, I would struggle to come up with a better idea to backdrop your original science fiction world with or a better archetypal hero with which to lead it. Naturally, Luke Skywalker was my favorite character. What follows is an essay on the legacy of Star Wars and Luke Skywalker, for me. One of the best aspects about Star Wars, and what makes it a master class in world building, is the decision concerning where, and when, we are thrown into the story. We join an intergalactic princess on the run from a what appears to be demonic cyborg and his space battleship. 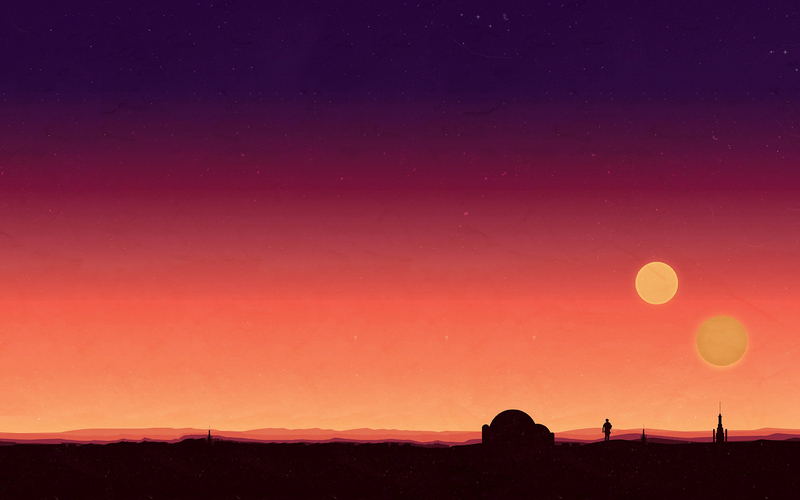 We spectate a dreaming farm boy on a strange desert planet with two suns, pondering what his role will be in such a conflict. So much is already in play and there is a real thrill in not being up to speed just yet. Over the course of events, we learn we have entered into a vast and strange world of galactic empires & associated rebellion, and one with years of mysterious and otherworldly history. This underlying sense of historical context makes the Star Wars universe breathe with a broad and vivid life we want to uncover more of. The sci-fi-oriented action of the trilogy is balanced by brief expositions into past conflicts, which are necessary to understand the current ones. It’s balanced well and doesn’t burden the pacing of the narrative. “The Clone Wars.” “Jedi.” “The Force.” It doesn’t take much, but it’s enough to pique the audience’s interest in the mythology surrounding our hero, Luke, his heritage, and his destiny. Soon enough, we learn of Luke’s fate to become a Jedi — a Force user and lightsaber-wielding hero to lead the rebellion. Like us, he learns that magic is real and begins to comprehend just how much he might be capable of using it. This fate is based in his bloodline, and we come to understand the fate of justice in the galaxy hangs in the balance. In the first film, the forces of good and evil are rather clearly defined, we can expect the heroes and villains to play out their requisite roles over the course of this story. Empire brings revelation and moral ambiguity; Return draws the curtains on Luke’s promised destiny as a Jedi Master. Throughout the remainder of the story, The Force being wielded in Luke’s hands, in battle and in meditation, represents the ultimate tool for deus ex machina to rear its head. In most dramas, this can cheapen outcomes. But for this series, it works. This inexplicable power of the The Force means our hero is capable of anything, winning any battle, escaping any dire circumstance, within or without. For a wide-eyed child watching and ready to believe in the impossible, this was a highlight. Star Wars gave me a hero to believe in, no matter what. What comprises our own life’s journey and how do we grow as individuals? Eventually, everyone must heed the call of adventure, in whatever form it will take. We feel compelled to venture out into the wilds of the world and see what we might see in a thrilling separation from the norm. We are introduced to new experiences and gatekeepers to realms we are uninitiated from. Perhaps a mentor guides us, shows us a path we can choose to take. We encounter challenges, conflicts, temptations along this road, trying to initiate into this strange world. These kinds of hardships make the trip worthwhile; the struggle and the climb up the mountain make the view from the peak more beautiful. At some point, we find ourselves shrouded in a darkness unrelenting. We succumb to our Dark Side; we can forget who we really are. But within our lowest moments, we find what we are made of. Transformation, rebirth, self-discovery. We find our way back from this adventure with something new. And in the return, we are not the same. We share our experience with those around us, changes are affected. Perhaps the most important wisdom gathered — from conflict comes growth; compassion is amplified within suffering. The near-perfect conceptualization of this hero’s journey, the monomyth, the metaphysics of the Dark Side and Luke’s internal conflicts alongside Vader’s own — compel Star Wars into the pantheon of legendary storytelling. Darth Vader, the principal villain and Luke’s own father, represents the archetypal conflicted tyrant. Haunted by a nightmarish past we cannot understand (He’s more machine than man now), and wielding a complex pathos (Join me, and together we’ll overthrow the Emperor and rule the galaxy together! ), Vader is probably the best character in Star Wars (shouts to Han Solo, runner-up). As far as nuance is concerned, the most arresting hero’s journeys we bear witness to are Luke’s and Anakin’s, especially in tandem. My initial reactions to The Last Jedi, and the continuation of Luke’s journey into this next generation of films, were decidedly… undecided. Much like Kylo Ren, I was conflicted (😏). And I am still torn between the good and bad within the film, all the while respecting the filmmaker’s right to tell a story of their own. Rian Johnson, writer and director, clearly had ambitions to subvert the Star Wars conventions, and he had the studio’s blessing to take this leap. Such ambitions pay off in creating some of the most striking and powerful moments in the entirety of the Star Wars films — the hyperspeed kamikaze, Rey & Kylo’s relationship and teaming up to fight against the Praetorian Guard, and for me, most saliently — Luke Skywalker’s swan song performance in the finale. In other ways, the movie was less successful — the unimpressive usage of characters (Finn, Poe, even Leia), poorly executed plot sequencing / overstuffed length of the film, and the distractions of much of the humor, which often felt forced. Regardless of the audience’s reactions of love or hate, the filmmakers certainly set this new trilogy on a different trajectory. While I enjoyed The Force Awakens, many of the complaints about it retreading the old grounds of A New Hope were valid and the decisions made in this film were likely influenced by those concerns. Beginning with the title of this film, in conjunction with the previous one, it was clear the conceptual signatures of the series were set to be at the forefront of the storylines to come — The Force and the Jedi. By choosing the timing of the films’ events to pick up approximately 30 years following Return of the Jedi, we learn of the fate of our heroes following their apparently less-than-decisive victory over the Empire — Han and Leia’s son, trained under the wing of Luke beginning a new Jedi order, becomes an evil tyrant and a darker empire, The First Order, arises from the ashes of the old one to wreck havoc upon the scattered rebel alliance. This feels rather … bad. To know that there was nothing even close to a happily-ever-after for the heroes of the previous generation is devastating in many ways. While perhaps necessary, to open this story back up and wreck the previous resolution for the sake of conflicts for a new generation of protagonists, is audacious. But the melding of the old with the new was a compelling notion to commit to, so I was intrigued. I think we all want new Star Wars and more importantly, we all want it to be good. The Force Awakens was a welcome entry to the series and introduced an excellent original cast of characters to go along with the franchise elders. I was on board. Han Solo, and legend Ford, turned in a satisfying performance and it was a fitting, yet supremely tragic, end to his character arc. Where the previous film embraced conventions, this one shattered the mold. I didn’t know what to expect, other than that this might be the end of my hero’s journey, the end of the Jedi itself. In The Last Jedi, the legacy of Luke Skywalker hangs in the balance throughout the films’ events. It was a fraught experience for an audience wielding only an exemplary image of him in mind for the past 30 years. Luke’s past failings, which we learn of in The Force Awakens, are more fully illuminated here and they bleed into the current conflict presented. Not unexpectedly, in the years following the rebel victory, he tried to bring back the Jedi; unexpectedly, he failed so miserably that he had to retreat from the universe. Luke was laid low, not by a tango with the Dark Side, but by an all-consuming guilt for creating a monster out of his sister and best friend’s only child. This is tragic, yet understandable. And yet, I hesitate to appreciate this kind of fate for my childhood hero. A paragon of morality, a relentless source for good and the Light side — actually considered murdering Ben Solo, because he sensed he had turned and would commit future atrocities? What of the Luke who never gave up on Darth Vader, on Anakin? What changed? Perhaps, it’s easier to look up and hope from a position of naivety (and upon your own estranged father), than it is to look down upon perceived darkness with the wisdom and cynicism of age upon your visage. Or perhaps they simply threw Luke’s fate into a meat grinder in order to generate a prime conflict for the high stakes re-emergence of the franchise. The bottom line: I had to reconcile this canonical fate for Luke Skywalker. And I have, for the most part, even if it wasn’t easy for me. This is the direction they wanted to go, I can still enjoy the old movies and I dig the new ones as well. But I think, I am an easy mark. I am an example of one who fully embraced the “legend” of Luke Skywalker, both in and out of the fictional Star Wars universe. Like he implies, this vision of himself is unrealistic, unsustainable, a lie. In truth, he’s still the petulant upstart from Tatooine, trying and often failing, to find his place in the universe. The filmmakers sought to bring our nostalgic memory of Luke back to a harsh reality, and to the suffering and misfortune true heroes must arise from. It is true – he learned the ways of The Force, performed great feats of heroism, learned from his failures, and ultimately played a vital role in bringing down the Emperor and the Empire. And yet, does any of this mean he necessarily deserves the happy ending, I and so many others, envisioned for him? The Last Jedi forces you to look upon the unseemly scene of our hero at present — a broken-hearted man, who simply wants to try to die in peace. Despite our best efforts, Luke Skywalker is human. He has closed himself off from The Force, the greatest source of his former power, and of his legend-self. He no longer wants to deal in the world he once knew, even if it might pain him to abandon Leia and Han and the Rebellion. Despite its sheer irrationality, I think he honestly believes himself to be of no use, or even a detriment. His own failings with Ben, now Kylo, helped to create the destruction now ravaging the galaxy. His actions appear to be complicit in the un-balancing of The Force itself. He went to the most unfindable place for a reason. And yet, after all of this, Rey does find him. And we find his story, his hero’s journey, isn’t over. Much like Han’s role in The Force Awakens, The Last Jedi is about the passing the torch to the next generation. In order for Rey to move forward towards her own destiny, and the Rebellion’s fainting efforts to reignite, we must first bear witness to the restoration of Luke Skywalker. In a reversal of roles, it is Rey who must convince Luke to believe in The Force again. “I need someone to show me my place in all of this.” Rey’s longing to understand her powers, to embark on her own journey, harken back to Luke’s own self. He agrees to train her, presumably because he believes it’s necessary for the survival of good in the galaxy, or because he believes her to be of good heart, capable of resisting the Dark Side. Perhaps it is both. This development is the first step in what becomes Luke’s reemergence of his legendary self. He doesn’t go back with her (not yet), but he teaches her the implications of what The Force is — an all-encompassing presence worthy of respect, and not simply something the Jedi can control for their own advantage. Luke gives Rey a history lesson, elaborating on the vanity of trying to dictate with the Force, and the hubris of the previous generations of Jedi in believing they could reliably control those within their order from the seduction of power. In truth, neither of you should have given up. After Rey’s departure to confront Kylo in an attempt to turn him back to the light, against Luke’s wishes, he is left to do some soul-searching. He hesitates when faced with the prospect of actually burning down the sacred tree (and “The Sacred Jedi Texts!” within). He can’t follow his own advice and resolve to move on from the past. The tree marks the physical manifestation of Luke’s own articulations on the matter of Jediism’s failings — the hubris, the over reliance on dogmatic thinking, the lack of an understanding of human nature and the inevitable pulls of passion. This intention to destroy it, and Yoda’s much needed intervention, mark the next significant step in Luke’s rediscovery. Much like Kylo, Luke wishes to move beyond the transgressions of their shared past — Luke in a retreat and Kylo in a fury. Neither have been successful thus far, but each progresses in their own right through the events of the film. But only one ultimately finds the path. The rising flames of the tree mark the disintegration of the final barrier to Luke Skywalker’s return to the fray. “What, you want me to go out there with a laser sword and face down the entire First Order?” Luke says self-deprecatingly to Rey near the beginning of the film. Despite his own past, he has somehow arrived at the conclusion that one man (or woman) simply cannot make a difference in the wider conflict, even a Jedi. But in the stellar third act of the film, Luke returns from the shadows — Rey’s intervention the operative spark. With the Rebellion in a last stand, he is given the grandest stage to act upon. Luke Skywalker’s walk-off performance here is memorable — it is easily one of the most iconic moments in Star Wars history, and especially meaningful to his character. After a much needed exchange and goodbye with Leia, he sets off to face down the First Order’s legion and Kylo, with nothing but his laser sword. But we soon find out he doesn’t need it. Luke impossibly withstands the full firepower of their machines and beckons an agitated Kylo to a one-on-one showdown. Their words to one another on the battlefield are a reflection of their now altered courses. Rey’s refusal (“Join me…please“) sends Kylo spiraling into the worst of himself, in which he tries to burn through his intergalactic, existential loneliness with hate. Truly, Rey and Kylo’s continuing relationship is at the heart of the entire conflict — a journey first of convergence (two lost souls, two kindred spirits) and then divergence (an embrace of the Light and Dark). Their scenes together mark the best moments of this film. Luke, on the other hand, has returned to a familiar self, one with a singular hope for the future (“I will not be the last Jedi“). Their blades never connect, there is no release of heated battle for Kylo to lose himself within. Before the decisive blow is to be struck, Luke’s words to Kylo carry the same weight as the words from Obi-Wan to Vader in a previous generation — “Strike me down in anger and I’ll always be with you.” You’ll carry me forever, a reminder of your actions which will come to haunt you and change everything about you. By the time Kylo fully grasps how severely he has been finessed, the Rebellion has survived and he’s hit with “see ya around, kid.” from a ghostly Luke, echoing his own father’s familiar gusto. The feat of Force Projection is a culmination of Luke Skywalker’s transformation. It conveys just how powerful of a Force user he has become. The action is a non-violent misdirection, a desired course for the Jedi in armed conflict and appropriate for a man hoping to make some reparation for past sins with his own nephew. Fighting a physical battle with Kylo was something Luke had no energy for, nor was it necessary. He chose a path of peace because it was the more effective route to take. My initial reaction to this, was one of disappointment — perhaps Luke should’ve actually been there, to face down Kylo in an epic lightsaber duel, for better or worse. But reflecting on Luke’s journey and seeing who he’d become through the events of this film, it makes sense. He was never going to leave the island, he had resolved to die there. But this didn’t mean he couldn’t make a tangible difference in Rey’s, and Leia’s, fighting the good fight, from the seat of his own meditation. By performing the tremendous feat of projecting his own form through The Force, Luke was embracing his legend self, an indestructible beacon of hope, at a time when the galaxy needed most to bear witness to it. He was taking responsibility for his own place in all of this. The Not-Last Jedi’s efforts here present a well-earned dose of deus ex machina once more, a necessary return to form for our phantom Jedi master. It allows Rey and the last of the Rebellion to escape from the overwhelming First Order forces aboard the Millennium Falcon, living to fight another day.